You are passionate about your area of discipline and committed to making it your top priority as you complete your post-graduate degree requirements. Many of you are also dedicating time, energy and thought as teaching assistants and research assistants. The FGS invites graduate students to participate in its annual professional development workshop series. Day by day, with support from faculty and graduate supervisors within your program, you are developing teaching and research skills for the future. The Faculty of Graduate Studies is here to support your academic experience but at the same time strives to provide you with the opportunities to develop transferable competencies that will assist you as you to move on to your professional life after graduate school. In this regard the Faculty of Graduate Studies is responsible for coordinating graduate student professional development activity across the campus. To do that, we work closely with partners units across campus and draw on their expertise to create programming and resources specifically for graduate student professional development. In addition, the FGS coordinates a series of workshops that focus on communication & career-readiness skills for all graduate students across the six academic Faculties. 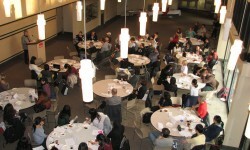 We also invite all graduate students to present their research at the annual Mapping the New Knowledges Graduate Student Research Conference — a rewarding professional experience within a vibrant multidisciplinary context. FGS also hosts the 3 Minute Thesis; a competition that challenges students to talk about their research and why it matters in a way that will inform and captivate people outside of their disciplines.